How to determine what cloud computing options are available to you. Cloud computing can be cynically defined as when your IT services go down because of a fault on a machine running on a network that you didn't even know existed. This isn't theoretical at all: Software as a Service (SaaS) using some infrastructure in the US or Europe can be rerouted behind the scenes, causing a poor user experience because of the additional latency. Regional redundancy can fail, knocking entire zones off a network. Configuration errors by infrastructure providers can cause your deployments to fail mysteriously. Foreign governments can seize resources and your data may be swept up in the confusion. But cloud is here to stay. Ever-increasing expectations about the speed at which the IT department must deliver with a flat or even reduced budget means the world has rapidly adopted cloud. Cloud portfolio management company RightScale says in its annual State of the Cloud report that 94 percent of organisations are experimenting with Infrastructure as a Service and 87 percent are using some sort of public cloud service somewhere. This has driven a corresponding growth in cloud service providers. Just the Infrastructure as a Service (IaaS) portion is a market that Gartner says will grow by nearly a third this year, despite considerable pressure on existing IaaS providers. To make sense of the cloud landscape, we present an incomplete guide to navigating it, divided up by the three major types of cloud service, along with the major players in each segment. IAAS is the entry level to cloud. Instead of running your own hardware on your own network in your own datacentre, you purchase virtual machine instances running on a cloud provider's hardware in their datacentre. All of the providers offer fine-grained calculation tools for their customers to see exactly how much things will cost, down to a per-minute basis. Pros: The ultimate in flexibility, both for the capacity and the type of resources required. Spin up resources when you need them, spin them down when you don't. Moves costs from capex to opex. Cons: Not necessarily cheaper, services and applications may need to be reconfigured, careful orchestration required between on-site infrastructure and cloud infrastructure, security considerations must be carefully evaluated. The smallest of the three major categories by market size, PaaS is nevertheless an important segment of the cloud landscape. Instead of virtual machine instances, PaaS providers offer an entire platform: operating system, development tools, databases, web servers and application servers. Your applications can be deployed on these platforms in the knowledge that the underlying infrastructure will support scale should you need it. Ever-increasing expectations about the speed at which the IT department must deliver with a flat or even reduced budget means the world has rapidly adopted cloud. Pros: Higher-level cloud functionality than IaaS, most major development and deployment environments supported, faster deployment and much less configuration required. Cons: Platforms can be restricting, both in terms of what will be allowed to run and what system and development libraries and tools are supported. 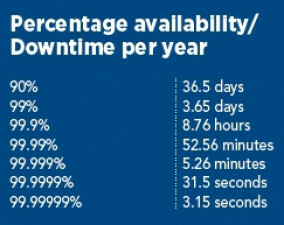 When a provider claims to have 'five nines availability', what they're telling you is that they expect only a shade over five minutes of downtime per year. But be careful how they measure it: Amazon, for example, used to factor in the previous 12 months into its running calculation, whether you were a customer or not. The ultimate in cloud flexibility: instead of buying virtual servers or virtual platforms, customers of SaaS pay per use of application software. The provider takes care of the complexity of the infrastructure, the platform and the support while the customer pays a fee per user. The earliest and to date the hardiest form of SaaS is e-mail, but almost all business applications have now become cloud-enabled. The downside to this is that quite a few software vendors have no idea how they will stay profitable on a monthly fee rather than an enterprise licence agreement. Pros: Highly competitive landscape, flat fees replace often opaque licence agreements, centralised updates. Cons: User experience highly dependent on connectivity, data ownership must be carefully managed, some traditional vendors are struggling with their own revenue models for the cloud. Right at the base of the premise of cloud, where the rubber hits the information highway, is the service level agreement (SLA). Here you find not only the expected level of uptime for the cloud service, the so-called 'number of nines', but also what you can expect in return if the service drops below that level for some reason. The first thing to note is the type. SLAs exist that apply to the bare metal in datacentres all the way up to guarantees that a particular business application will be available to each of your global branches. For a typical cloud service, look for a statement of network availability, one for server availability (if applicable), how quick the response time for outage queries has to be and how much latency the service should have. But that's just the beginning. Dimension Data's white paper, 'Comparing Public Cloud Service Level Agreements', notes: "Oftentimes, SLAs cannot be simplified into the number of nines. Finding the SLA truth, and whether a service provider will meet your requirements, depends on the details of how they define their SLA measures and penalties." For the large customer used to penalising contractors hundreds of thousands a day for non-achievement of service levels, cloud SLAs might come as a shock. Naturally, no cloud provider is going to be able to mitigate all of a business' risk, but still, the best you can hope for is a year's subscription (Azure) or ten percent of your monthly bill (Amazon), or 100 percent of the monthly service fees (Rackspace Cloud Server Host SLA). Make sure these are carefully understood when signing up. Some SLAs even have dodgy clauses that specify you only get a refund on the actual resources that failed, a rather disingenuous redefinition if ever there was one. CIOs' main jobs are to keep the lights on, keep the costs of doing so predictable and provide the ICT services the business needs to grow revenue or cut costs. Cloud computing is ultimately just another tool they can use to achieve their goals. This article was first published in the [March 2016] edition of ITWeb Brainstorm magazine. To read more, go to the Brainstorm website.